When shoulder pain presents and then quickly goes away after a few days, it probably is not something to worry about. When shoulder pain lingers on for an extended period of time and/or increases in severity, it should be seen by an orthopedic specialist. An injury that requires medical treatment is probably causing the pain. The shoulder is a ball and socket joint made up of the head of the humerus and the glenoid cavity of the scapula. A partial shoulder dislocation or shoulder subluxation occurs when the head of the humerus partially slips out of the glenoid cavity. A complete dislocation occurs when the head completely slips (and usually remains) out of the cavity. In many cases, a shoulder that has been dislocated needs to be relocated or put back in place by an orthopedic specialist. A tear in the glenoid labrum, a rim of soft tissue that holds the ball in the cavity, or rotator cuff tendons may be associated with a shoulder dislocation. Both of these injuries need to be treated by an orthopedic specialist. Active individuals and athletes who can not participate in the activities or sports they love should see an orthopedic specialist. Their pain and the injury that is causing will be accurately diagnosed and effectively treated so they can recover in an appropriate amount of time. The field of sports medicine is more advanced than ever. Numerous nonsurgical and surgical treatment options are now available. Internal (towards the body) and external (away from the body) movements are controlled by the rotator cuff tendons. When these movements cause pain or when these movements can not be performed, an orthopedic specialist should be seen. A rotator cuff strain or tear may be causing the pain. 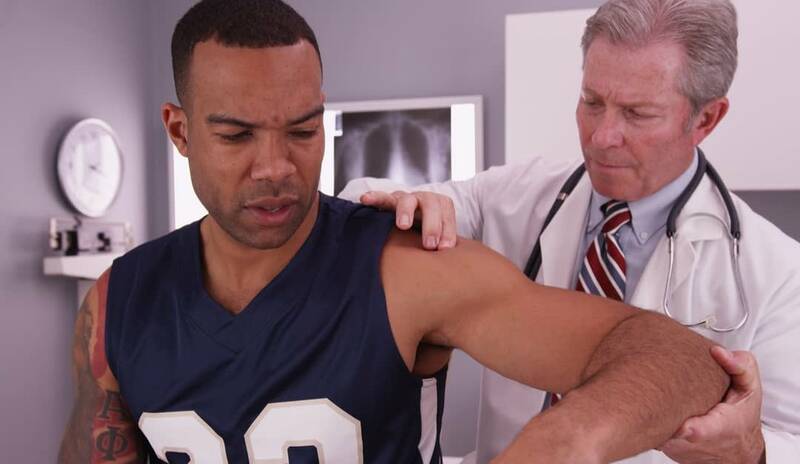 If you are experiencing shoulder pain and would like a treatment solution, please contact our office to make an appointment with one of our orthopedic specialists. Our office representatives can be reached M-F during normal working hours. We have locations in Wayne, Clifton and Englewood, NJ. High Mountain Orthopedics specializes in bone, joint and muscle injuries, including shoulder injuries. Dr. William Matarese, Dr. Tony Wanich and Dr. Sherwin Su have over 25 years of combined experienced treating orthopedic and sports injuries. Our practice uses a multi-disciplinary approach that includes on-site physical therapy and activity modification. If surgery is necessary, our team utilizes the latest advancements in Minimally Invasive and Arthroscopic procedures to expedite the healing process. If you are suffering from a bone, joint or muscle injury – contact our offices today!